why does it creep into my bed at night? why do we see the worst after moments of love? can it be the house that makes me lonely? i must go to the water. good morning. i am going to write 30 poems before december. then the ways i do. Rebecca Solnit says infuse hope. Z, our mutual friend, says the same. human beings break hearts and planets. or is it stars? small love, big love, what’s the difference? is there a difference between a broken heart and a nuclear bomb explosion? nobody knows the difference or cares, so you must knock on the doors of your neighbors’ houses, and give them this quiz: where is the closest nuclear power plant? what is a storage pool for spent nuclear fuel rods? what temperature must it remain before the rods explode? how do you split an atom? why in the hell would you split an atom? why do they use uranium and where does it come from? what happens to a landscape that is mined for uranium? do you know what happens when a terrorist flies a plane into a spent fuel pool? i am looking at the ocean now and changing the subject. subjective realities are far more interesting than objective realities. don’t objectify me. say, what is the goal of philosophy or literary theory? do something real. plumbing. build a house. seed the earth. this word is an abstraction, a hyperreal non-thing. it. don't be so high and mighty. i/me will tell you what’s real. loneliness. running water. three full core meltdowns. millions of gallons of radioactive water. children with thyroid abnormalities. death. weep not for the weary. or the mothers who flee with internally contaminated children. it's so easy to confuse the poor ignorant people who cannot understand physics or the news. three big tuna swimming in the sea. radi-o-act-i-vi-ty. am i the walt whitman of the sea? my chest hurts, right in the spot on the upper right of my chest near the shoulder almost where the port catheter used to live. turn down the volume please. i am getting way too loud. search in the archives. be thankful. hang on tight the american e-conomy is sinking/booming shale/gas/tar/oil and privacy has been given up to Google. hello edward snowden. i was in the Russian airport, too, a summer ago. it was empty in Moscow and crowded in Petersburg. swimming pools. Americans. we have them in our back yards. they are mostly kidney shaped. in Japan, it is the old people who protest now. i dream of swimming in and out and around them. spent fuel rods. radioactive mermaid am i.
the fukushima workers have been lied to. they ingested 20% more radiation than previously told, but they, lucky souls, get free cancer testing. catscans are highly radioactive. e-qual to exposure to the Hiroshima explosion. all things being equal, i did not see that on the form when i signed away my future. look homeword angels. Buddha Blue. hope. there is always hope. a man stands with a remote driving an electric car in the parking lot by the beach in the too warm weather. every day i ask the question: what will become of us? we save pictures of animals on our computer screens and love one thing only. this quiz counts for 100 million years of oceans free of human trash. this poem is too long. i wrote it in a parking lot. in front of me while I sang Pete Seeger's "God's counting on me"
cells killed by the chemotherapy that saved my life. yes. breathe. now. stop. again. sigh. buddha. the words on the page of our service. again. start. they say Georgie and Cheney knew before it happened. york times so. amen. it must be true. suburbia smelled of poisonous stench for days. a new idea. start. here. looked down at me and said "quit this job. the people all said sit down, sit down you're rocking the boat. made $300 a week. we had health insurance. aprons. stockings. buns. hair spray. high heels. asbestos never saved those people in toppling towers. maybe that's where my cancer came from? asbestos air and strontium 90 in my baby milk? DDT for the birds and the bees? oh silent spring. oh Rachel Carson. oh yom kippur. back to the mourning. kol ni dre she plays violin. sixteen now. i thought about my mom and dad. i thought about the vanishing honey bees. i thought about the vanishing ice. what my people have. done. Hello, it's Rosh Hashanah, meaning a new year. What do you have to be sorry for and did you apologize to all those whom you might have hurt? We're about to go to war, for the sake of something. What something? We will kill to save more lives? To make a point? To show our strength? I dropped her off tonight and did not go. Feeling sorry for myself, on the freeway, in the car. My car. My car. My car. When I realized when something breaks down. We only know the fragmentation of the bombs. No, that's callus and forgetful. Again, callous and forgetful, I will look to orion. So many American soldiers. I'm sorry. It's the week of I'm sorry. Yom Kippur coming right up. Through cancer. Through the street people and the homeless. Through Agent Orange and Depleted Uranium and Chemical Warfare. All those test bombs. oh those. A terrible mother, I am. Sorry VERY Sorry for bombing your country. Just so no one gets worried about me as I've been a bit silent, lately, all is well. It's been a busy, busy year. Here's what I did since last Fall. As an act of cracking eggs to enlighten the young, in addition to teaching my normal load of two courses a semester, plus directing dissertations (my PhD student Ula Klein just graduated and I'm so proud of her and her work), and writing articles for magazines, and Directing the Environmental Humanities major in our Stony Brook University Sustainability Studies Program, and becoming Interim Director of the entire Stony Brook University Sustainabilities Program (are you tired yet? I am! ), and trying to complete my environmental memoir, I taught two freshman seminars on Environmental Film. Oh, don't forget (I almost did), I taught TWO summer classes on environmental literature and film-- graduate and undergraduate. I'm sure I've forgotten something. Why, pray tell, would I be so crazy as to add two courses on top of the other two and on top of everything else in the spring semester (or the summer courses!)? It's my calling to wake students and others up. That's why. Desperate times call for desperate measures! The Freshman seminars meet seven times. So I showed six environmental films and we talked about the environmental issues related to these films... Here's what the students viewed: Earth 2100 (climate change), Rachel Carson's Silent Spring (made for PBS), Gasland 1 (2 wasn't out yet), Into Eternity (nuclear waste), Food Inc, and No Impact Man (along with the video short- The Story of Stuff). So, we covered: climate change; nuclear power, weapons and waste; toxics, chemicals and cancer; fracking; food and agricultural rights; garbage, waste and consumption. The last--No Impact Man! was the lightest fare and left the kids with suggestions of things they can do, as well as a bit of humor and hope. I think I made an impact with these two seminars... as the kids run off to their various majors, they said they plan to bring environmental awareness into these different fields, from Business, to Chemistry, to Engineering. Very cool. My other class: Eco Media (yes, I teach a class on environmental media-love it!). In this class, my students created an amazing amazing live blog, and they wrote sharp critiques of all of our readings and film viewings -- on current environmental events in the media. We were visited by a live New York Journalist--Karl Grossman, we attended a brilliant symposium on the future of Nuclear Power post Fukushima, hosted by Helen Caldicott, in the NYC. Many of us took buses at 5 am on a freezing winter day to Washington, DC, where we attended the biggest Climate Change rally ever-- headed up by Bill McKibben and Sierra Club. One group of my students made an amazing film about the impact of Hurricane Sandy on the Great South Bay. We all participated in Stony Brook University's Earthstock (Earth Day Celebration), presenting research projects on toxics and cosmetics, fracking, GMOs and pesticides and food, and Hurricane Sandy and Climate Change. Many folks at Earthstock were stunned, mesmerized, and impressed by what my students had to say and offer! Oh and here are some other things I organized for the Eco Media class and the Freshman Seminars: two public showings of Dear Governor Cuomo, with the filmmaker, Jon Bowermaster, speaking! What a great guy and what a rocking, rousing and inspiring film. One showing was in Huntington, NY, at the Cinema Arts Centre, and the other was at our Stony Brook Campus. Gosh, there's so much more.... summer classes and attending The Clearwater Revival Festival with my students and working in the Green Cities Tent, again! Hands-on environmental learning from the experts at its best. Thank you Ryan Palmer, Manna Jo Greene, Karla Raimundi, and Linda Richards, for pulling this astounding learning experience together for my students, once again. Unforgettable. Last but not least, I just came back from Omega Institute, where I gave a lecture on the Power of Environmental Literature. That was a lot of fun to put together. I spoke about the profound influence of literary words on environmental activism. Skip Backus and Laura Weiland created an amazing six-week program there on Sustainability (one of my students attended) and I was delighted to jump in and speak with this very engaged group and others for the evening. Now, more to do, more to do... and back to revisions of my book.... soon to come to a store near you! I walked and the creatures came to see me. The rabbit stopped to say hello and a brown bird. With a sharp black beak and orange fleck on his cheek. A striped chipmunk scurried under my feet. They looked into my eyes. Bird after bird perched near me. Please, they said. We know our time is up. Yet I don't want to let on that. And then I saw a field of bright colors. And then the people emerged from the tunnel. 1) You lose your mother to cancer and other disease. 2) You want babies and can't have them. 3) You get cancer and think you'll really never have them. 4) Post-chemo: you have a baby. 5) You want more babies and cannot. 6) You look back in love and awe at your mother's political and activist work. 7) You become your mother and try to save the world. 8) You feel: Gratitude and grace for the gift of motherhood. It's a fraught day for many, a joyous one for others. I know, first hand, both the immense pleasure of being a mom, and the intense pain of wanting to be one and not being able to. I also know the angst of losing a mom, the challenges of working full time and parenting, and the difficulties of raising a child alone. It's a complex role, motherhood. First, I lost my mom, too young. That's a complicated story. She was a complex person, married to a very difficult man. It took many years for me to come to grips with her greatness. I always saw her as weak and fallen, but now I see her differently. I see her as a victim of her time. I see her as a hero. That's the story of the book I'm writing. And then there's the challenges of being a mother myself. For years, I wanted to be a mother. I mean really, really wanted to be a mother. It was an obsessive desire. I wanted to have five or six kids: With Six You Get Eggroll, The Waltons, Yours Mine and Ours. It didn't seem to be in the cards for me. Yes, I was of the generation of women that wanted to work and have a family--but it wasn't my career that got in the way, I just didn't seem to fall in love with "traditional" marriage or child-friendly guys. They were artists, actors, dancers, hippies, and free spirits who saw the nuclear family as confining, repressive, anti-happiness. So, for years, I watched, with intense envy and sadness, other women get pregnant, give birth, and do it again and again. Everywhere I went, there seemed to be women with babies, toddlers, and pregnant women. My friends all had kids. Not just one, but several. The man I loved through my late twenties and thirties "wasn't ready and wanted to wait to have kids." I waited for him to change his mind, to feel at ease. My partner poo-pooed the "nonsense" I told him about the decline in fertility rates in women as they age. He thought medical statistics "were all in the mind." The years went by and the clock ticked. Then, in my mid-thirties, I got cancer and faced an onslaught of intensive chemotherapy treatments. Chemotherapy, my physicians said, might very possibly render me permanently infertile. I was bereft and upset with myself. Why had I hung out waiting for someone else to make up his mind, when having children was so vital to me? Now I might never have biological children of my own, now I might die and never experience motherhood at all. There was no time for freezing eggs. I needed chemo right away. Out of guilt, and possibly a sudden waking up to the sacredness and fragility of life due to my life-threatening disease, my partner then promised to have a baby with me when I was healthy enough to try. Two years later, we tried to get pregnant. Nothing happened. Then after much help from an excellent reproductive endocrinologist, I became pregnant and gave birth to a beautiful, healthy girl. At last, I was a mom. She was and is my miracle. Yet. Even though I finally had a child, I still ached for more. So, I tried and tried, but I could not conceive again. I went through several years of giving myself shots of hormones daily, of multiple surgeries and treatments and various drugs. No luck. Every month, I went through a dramatic cycle of hope and disappointment that took a heavy emotional toll. Finally, I ran out of steam and stopped trying. I was too exhausted to go through the adoption route. The grieving and longing for more children passed in time. Today, my heart is full with joy and gratitude for all that I have. My girl amazes me more and more each day with her kindness, intelligence, grace, vision, and generosity. My relationship with my own mother has evolved over the years as well. Growing up, my feelings about Mom were fraught. When she lived, I saw her as the beaten-down woman of an abusive husband. I wanted Mom to be strong, to get out and save herself. Now, twenty years after Mom's death, through researching her life in more detail for my book, I discovered that she was an important environmental and peace activist. She put her own body on the line to save the lives of many. I have also come to understand the complexities of motherhood in a patriarchal world. It's not easy to leave an abusive relationship, and it was more difficult in my mom's lifetime. Fingers pointed at women when men misbehaved or when marriages failed. Women were supposed to keep everyone else happy. Adrienne Rich explained it all as a kind of altruistic self-sacrifice. Yes, we still have to be very careful not to fall into the trap of mommy and women blame. I was guilty of mother-blame myself when Mom lived. I now see how deeply and positively Mom influenced me in a myriad of ways. For Mom's sake, I wish she could have put feminism into practice in her marriage, yet I no longer blame her for not being able to do so. On a very positive note, I have come to follow Mom's path as an activist who works to protect all children from the polluting of our earth. Every day I thank my mother for giving birth to me, and for teaching me the value of working on activist causes for the good of the earth and all living beings. Every day I look at my daughter with amazement and feel immense gratitude for the gift of motherhood and all that it teaches me. Today, when I'm feeling any (mothering) grief, helping to take care of our mother earth is the best medicine of all. On April 24, Sandra Steingraber completed her 15-day prison sentence for “acting out” peacefully against the violation of our bodies and the earth by corporate polluters and environmental exploiters—in this case, the gas and hydro-fracking industry. Sandra, like me, is a mother, cancer survivor, writer and activist. Her books, Living Downstream,Raising Elijah and Having Faith contribute greatly to my thinking, writing and teaching. Like Sandra, I know firsthand how the polluting of this planet causes unnecessary and horrific suffering for present and future beings. And, like Sandra, I am frustrated about how little has changed for the better over the years, despite copious evidence she and other scientists have compiled that points to the links between toxic pollution and cancer, neurological disorders,asthma and other disease. A myriad of health problems such as these and others abound from the lack of environmental regulations in the U.S. Also, like Sandra, as a mother, I worry about what the future holds in these environmentally degraded times for all children present and future. These days, protecting our children takes on a whole new meaning. So much is out of our control, and the stakes are crazy. Every day, citizens breath, eat, drink and encounter toxic materials without their knowledge, consent or will. We need a Safe Chemicals Act, among other things. We’re in the midst of a climate crisis that’s spiraling out of control and scientific predictions are dire. We’re running out of clean water. We’ve got tons of radioactive waste that lasts for thousands of years, and no safe place exists so far to store these hazardous materials. Pollinating insects are vanishing. Crucial sea life is beingdestroyed. “Even life itself seems to be running out,” Michael Moyer and Carrie Stors write inScientific American, “as biologists warn that we are in the midst of a global extinction event comparable to the throes of dinosaurs.” Things are bad, really bad, and future generations will bear a terrible burden for our hubris, negligence and greed. From writing and speaking to civil action: What led Sandra to land in jail? I think that like a lot of us moms and cancer survivors who work on these issues, she’s had it. Unlike many (or most, I should say), however, Sandra truly has the courage of her convictions. So when Inergy Storage and Transportation planned to use Seneca Lake, located near her home, as a dump for fracking waste (propane, butane and methane), Sandra put her body on the line. She and others performed a peaceful act of civil disobedience by ‘blockading’ the gate of Inergy’s gas compressor facility on the lake. Sandra was arrested for trespassing. While in prison, Sandra wrote a series of powerful letters to the world about her act of civil disobedience. She wrote and drew upon the tradition of Thoreau, Gandhi, Parks and King. You cannot read her letters without being deeply moved. Sandra provides compelling reasons to follow her call. She’s singing out for a peaceful, creative and joyful mother’s revolution. It happened before and it worked: They were the mothers of Women Strike For Peace (my own mom was one of them) and they helped stop above-ground nuclear test bombing in the U.S. in 1963. I believe we will do it again. Crossposted from Ms. Magazine Blog. 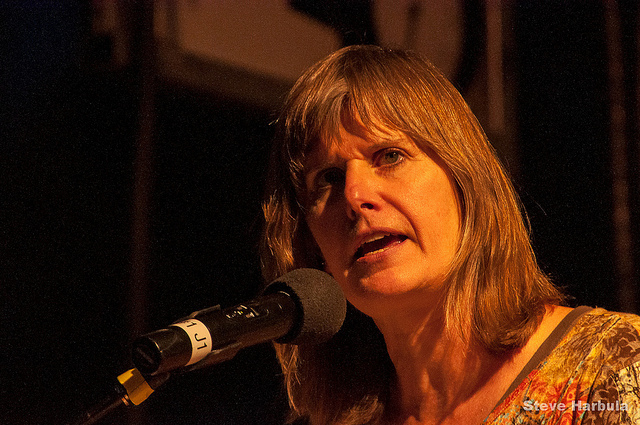 Photo of Sandra Steingraber courtesy of Flickr user SteveHarbula under Creative Commons 2.0. Guardians of the Garden: What's My Faith? I've changed my faith or religion or spiritual practice a lot over the years. I was born to parents of Jewish ancestry, but they were Unitarians, or Jewnitarians, as their friends joked. I was born to hybrids. When I was twelve, we moved to Israel, largely because my Dad felt guilty for not teaching us kids about our Jewish history. It seemed to me to be too much too late. It was an alien country and faith to me. I felt terrible about the holocaust, and I understood Nazis would kill me whether or not I felt Jewish, but I still didn't feel like kissing the ground when we landed in Israel. At thirteen, I went to Quaker boarding school in the mountains of North Carolina. As students, we didn't go to Meeting much, but we spent our days and nights outside in nature. You might say it was in the mountains I found God. I came home to myself and fell in love with the streams, rhododendron, sandy mica paths, and black mountaintops. I loved sliding down rocks in the South Toe river, sliding down mountain sides in the snow, skating and swimming in natural ponds, resting in wild grasses and staring at the stars on windy nights. My house parents had to drag me inside to go to bed at night. As a young adult, I flirted with Christianity, walking in and out of churches and cathedrals in New York City. I later followed my partner to an ashram in New York City and meditated for several years. When I became a mom, I felt the need to find a religious faith with "normal" holidays to celebrate, and since my partner and I both came from Jewish ancestry, we joined a synagogue, went faithfully to Shabbat services, and practiced the Jewish faith for fourteen years--Challah, matzo ball soup, Rosh Hashanah, Yom Kippur, Passover and all. We still do. It's good for the family. As my daughter grew older, I searched again and I began meditating with a local Buddhist group. Each of these religions offers me different ways to understand and deal with the challenges of the human condition--but, above all, what I have come to embrace most deeply in my search for faith, is not an official religion, with a title or building or set of written laws, practices, and rules, but my experience of and with nature. It turns out that my greatest devotion, commitment, love and joy, outside of parenting, or perhaps integrally linked to it, is connecting with and protecting the earth--soil, rock, water, mountains, oceans, rivers, trees, animals, birds, reptiles, and all living creatures. My belief in nature makes me understand that if I love this blessed nature so much, then I have a sacred duty to protect her. Yes, I want to guard and protect our beautiful earth. I want to be sure that clean water, air and soil are here to stay for all future beings, human and nonhuman. That is my rock solid faith. This video, made by my friends Doug and Patti Wood, founders of Grassroots Environmental Education, inspired these thoughts. "We were called to be guardians of the earth." It's been a really busy week. We showed the film, Dear Governor Cuomo, at Cinema Arts Centre in Huntington, NY on Tuesday 2/12. The talks given after the film, by the filmmaker Jon Bowermaster and Patti Wood, from Grassroots Environmental Education, were highly informative. Coincidentally, on Tuesday, there was a small win on the New York anti-fracking side, as the DEC (Department of Environmental Conservation) determined they need more time to examine the SGEIS Fracking health impact study before moving forward with drilling in the state of NY. However, things are far from certain--it's just a short delay. New York still doesn't have a ban on fracking. It's important that we keep the pressure on. As Michael Green says, "It's not too late for New Yorkers to take action and tell the governor not to repeat the past mistakes...with fracking. Write Governor Cuomo, tell your state Senator and Assembly member, and write a letter to the editor. Add your voice to the millions of New Yorkers who want to put our health and environment before the fracking industry's rush to profits." Call Governor Cuomo and tell him to Ban Fracking Now: 518-474-8390. Meanwhile, on the Climate Change action front, we've filled two busloads of people from Stony Brook University and other locations on Long Island, and we're headed to DC on Sunday, 2/17, to protest the Keystone XL Pipeline and Climate Change at large. The protest is hosted by Sierra Club and 350.org, along with many other environmental organizations, including Coalition Against Nukes and No Nukes NIRS. We want President Obama and our politicians to hear our voices loud and clear. It's time to change our energy policies to truly renewable ones--wind, solar, geothermal, and it's time to make massive and systematic changes in our transportation and production systems in the U.S. and the world. We cannot continue to exploit our environment as we have been and hope to survive. Earth first--not profit for corporations. Climate Change is already upon us, so we really have no time to lose. Act, speak up, change how you live. There is no time to lose. My heart breaks for the future ones, but I'm not sitting on my hands or closing my eyes. Please join me and the 20,000 or more who feel the same. We'll be marching for the earth and the future generations. If you want to join a Climate Change rally this Sunday, you don't have to go to DC. Please see this exhaustive list of protests taking place all over the U.S. in Michael Lerner's piece in Tikkun. You can rally for the planet on 2/17, from just about anywhere. Sandra Steingraber Calls Us Back to Albany-January 30 & February 4. An Urgent Call! I am writing you from an airport in Wisconsin. People here, and across the river in Minnesota, are trying desperately to halt the strip-mining of their communities for frack sand. Trucks are rolling. Silica dust is flying. Hill by hill, bluff by bluff: the land itself is shoveled into railcars and shipped off to the gas fields of America where grains of silica sand are shot into the cracks of fractured bedrock so methane can flow out of it. What’s left behind in Wisconsin and Minnesota are moonscapes and ruined water. Citizens write, testify, protest. Mothers contemplate civil disobedience. Some have done it. I’m calling you, again, to Albany. Once on Wednesday, January 30th and a second time on Monday, February 4th. And you are not allowed to feel depressed about it. Okay, you can feel depressed all you want, but you have to show up anyway. And you may have to get up in the middle of the night because we all need to be there by 8:30 a.m.
Three weeks ago, New Yorkers created a chanting, drumming wall of opposition to fracking that stretched a quarter mile down the Empire State Plaza concourse. Every audience member en route to the governor’s speech was compelled to walk by the biggest demonstration on at any State of the State address in the history of New York. Next we delivered 204,000 comments to the Department of Environmental Conservation, all of them arrows aimed at the arbitrary, incoherent draft regulations on fracking—cynically released by the DEC as a legal maneuver to avoid blowing their own deadline. Given just 30 days over the holidays to read 328 pages of regulations and compose our thoughts, we broke all records for number of public comments submitted on any DEC topic. Ever. Did you think that alone would be sufficient to stop the most powerful industry on earth from fracking New York State? The signs coming out of Albany do not say the answer is yes. Sorry. What should we do? Give up? Or act like the citizen uprising that we are? Here’s the plan: First, sign The Pledge to Resist Fracking in New York State. Doing so is a solemn commitment to join with others in acts of peaceful, non-violent protest—“as my conscience leads me”—should Governor Cuomo approve fracking in New York State. Invite others to sign. Let’s build a formidable wall of signatures. As of today, 6,500 names are on it. Let’s build it higher. So silenced, we’ll protest the secret, hasty, improvisational nature of the state’s “health review” on fracking, which the DOH has prepared with no public input whatsoever, after rebuffing New York’s medical health professionals, and while subjecting the outside reviewers to gag orders. The message being: Halt the sGEIS. Show us the damn review. Cameras will be rolling. Let’s pack Hearing Room B. Cameras will be rolling. Let’s pack Hearing Room B with an overflowing crowd that swirls like a river and astonishes everyone, from the Albany press corps to all the governor’s men. Which they loved, by the way, in Winona, Minnesota. What the gas industry has: money, political access, paid lobbyists. What we have: science, love, unrelenting resolve. In his second inaugural address, President Obama named three places where human rights were born. Seneca Falls. Selma. Stonewall. Upstate New York’s homegrown resistance to high-volume horizontal hydraulic fracturing. . .has continued to faceoff against the energy industry and state government in a way that may set the tone for the rest of the country in the decades ahead. In small hamlets and tiny towns you’ve never heard of, grassroots activists are making a stand in what could be the beginning of a final showdown for Earth’s future. This is our moment. Perhaps you never thought you’d get a chance to play hero. Here it is. I am writing to you from my own house. I need to find a babysitter. I need to cash a check. I need to shelve a work project. I need to cook ahead. I need to cancel music lessons. I need to find a ride. I will be with you in Albany. This is not fun. This is not easy. The water that flows from my kitchen tap is the blood of my children. I will meet you in Albany, January 30th and again, and even more urgently, on February 4th. This is huge. This is it. On Wednesday, January 9, nearly 2,000 people rallied against fracking outside of Governor Cuomo's State of the State Address, in Albany, New York. Folks danced, chanted, shouted, drummed, and waved signs. Pete Seeger sang, the Reverend Billy Talen shook and shouted halleluyah, Sandra Steingraber, Debra Winger, and Natalie Merchant spoke. Voices of the thousands rang out loudly for hours. Activists called for a permanent ban on fracking in the state of New York. Geologists, chemists, biologists, and medical doctors argue that fracking is a threat to public health, will produce hazardous air and water pollution, and will endanger the state’s food supply. It will contribute negatively to Climate Change, according to Phil Aroneanu, campaign director of 350.org. Of additional concern to many, as reported by Treehugger and the New York Times, among others, is the release of dangerous radiaoactive materials into the ecosystem through the fracking process. As of now, the gas industry has no means or plan to contain such radioactive waste. The rally was inspired and led by those who are concerned, in particular, about the revised DEC's fracking regulations, issued at the end of November, 2012, and before the completion of health and science studies called for by Governor Cuomo, to determine the safety of hydraulic fracturing in New York. The public comment period on these regulations began on December 12, and ended on January 11, 2013. This gave the public a very short period of time to read and digest these complex regulations--during the holidays, and after Hurricane Sandy. Regardless, fracktivists jumped quickly to action, with a call to all New Yorkers to participate in a massive letter writing campaign-- Thirty Days of Fracking Regulations--led by Sandra Steingraber and Grassroots Environmental Education. Many other grassroots fracktavist groups followed suit with their own fracking regulation letter-writing campaigns. In total, 204,000 individual letters critiquing the regulations were hand delivered to the office of the DEC on January 11, by Sandra Steingraber, Sean Lennon, Yoko Ono and others. On January, 10, following the rally, a public hearing to address the concerns of scientists, physicans, economists, environmentalists, and other citizens regarding the DEC's revised fracking regulations took place in Albany, New York. Politicians were sympathetic to the many concerns of those who spoke. My name is Sandra Steingraber. I am Distinguished Scholar in Residence in the Department of Environmental Studies at Ithaca College. My Ph.D. is in biology, and I have spent the last twenty years researching and writing in the field of environmental health. I have served as a science advisor at both the state and national level, working with the state of California on its research program to investigate the causes of breast cancer and with both the National Action Plan on Breast Cancer under the Clinton Administration and President’s Cancer Panel under George W. Bush. I’m here to speak today as a founding member of Concerned Health Professionals of New York. This is a group of scientists, physicians, and nurses that came together last fall, in a spirit of shared alarm, when we learned that the DEC’s study of the health effects of fracking—which we had long asked for—was not going to be conducted using any normative protocols nor in an open manner, which is also normative for public health inquiries. A normative protocol for a health study that attempts to forecast the public health risks of a polluting activity that has not yet been approved is called a comprehensive Health Impact Assessment. It was designed by our nation’s Centers for Disease Control and is endorsed by the World Health Organization. An HIA has, as one of its fundamental elements, democracy. It is scoped and carried out in a transparent manner and with the participation of the public at every stage. This participation takes the form of public hearings and periods of public commentary. It does so out of the recognition that when the public is being asked to endure possible risks to its health from a polluting industry, the public has the right to witness and participate in the study that will help determine the decision-making as to whether to permit or prohibit this industry. In addition, when the lay public contributes its own local and historical knowledge to an environmental health study, the study design is better for it. Public participation makes for better science. What is going on right now with the so-called health study underway at DEC and DOH is the very opposite of that public spiritedness. The DEC has, under the cover of secrecy, scoped and carried out a health review of some kind that no member of New York’s scientific community has seen. This review is itself being reviewed by DOH chief, Dr. Shah, and a team of three distinguished public health experts from out of state. We do not know what this team has been asked to review, but we do know that two of the three of them have signed contracts with non-disclosure agreements. And we do know, from the introduction to the newly released regulations for hydraulic fracturing released by the DEC on November 29, that the decision whether or not to frack New York hangs on the results of these outside reviewers. Thus does the health of 19.5 million New Yorkers depend on the results of a secret review of a secret review. And thus, Concerned Health Professionals of New York came together. Not knowing what data the reviewers have been asked to comment on, we hastily created a website on which we uploaded all of the important reports and peer-review studies that we know of—from investigations of well casing failures to radioactivity in production brine (which is to be spread on our roadways). We also uploaded our many unanswered letters to DEC Commissioner Martens, DOC Commissioner Shah, and Governor Cuomo. And I’d like to add here as an aside: My 11-year-old son receives answers to his letters to the Governor. I never have. We share the same mailing address. Concerned Health Professionals of New York also took the unusual step of creating an eight-minute video message to the three outside panelists in which we—doctors, nurses, and scientists—describe our long-standing, unaddressed concerns about fracking in New York State. We uploaded this as an embedded video. And then we emailed each of the reviewers to let them know that we had created this website repository of data for them, out of our concern that the document that they are reviewing—whatever it is—does not address itself to all the animating issues. Can I just say how crazy this feels to us? These three outside experts are our colleagues. Two of the three are personal friends of mine. We have spoken together on panels and at conferences. They share data with me. I cite their research in my writings. And now a gag order prevents them from speaking to me about data that I as a New York scientist am not allowed to see. The leak last week to the press of what looks to be an old draft of this health review turns our alarm into full-blown cynicism. This eight-page document contains no data. It is a series of assertions that seems to say that the health effects of fracking are unknown and unknowable by any future research. Therefore, regulations can mitigate them. Therefore, fracking is safe. This is not sound scientific reasoning. The premises on which its logic rests cannot be evaluated because there are no citations or footnotes or references. Emerging evidence in the scientific literature flies in the face of its conclusions. I’m aware that this Assembly has invited the DEC Commissioner to his hearing to explain himself—an invitation that he refused. To justify the no-show, DEC spokesperson Emily DeSantis issued a statement pointing to the previous hearings attended by Commissioner Martens. Concerned Health Professionals of New York condemns this statement. The refusal of the DEC to appear at this hearing and answer questions about the health review has not only broken Governor Cuomo’s promise of transparency, it has broken public trust itself. Although New York citizens have been entirely cut out of the decision-making process on fracking, the public continues to have profound interest in participating in the inquiry and the decision-making process of fracking. I know this because I designed a website to help people create comments on the revised draft regulations over the holidays. It’s called Thirty Days of Fracking Regs, and it takes an Advent calendar approach to public commentary. Each day, for the last 30 days, I have posted on this website one regulation, which I then translate into plainspoken English. I then provide some science relevant to that regulation. Because there is no final SGEIS to serve as the scientific basis for the regs, I did that research myself. I then invited the public to create a handcrafted comment about that regulation. Tomorrow, I will be hand delivering all the comments that my readers and I created together. There are more than 20,000 of them. All are original and unique. As a metric of public commitment and concern, I would like to point out that 500 of them were written on Christmas Day. On New Year’s Day, more than 1000 comments came in. In addition, college students home on break devoted their free time to crafting comments as part of a group project called Homework Against Fracking. These and other initiatives that have guided citizens through the comment-writing process means that we will hand-deliver to the DEC more than 200,000 comments tomorrow, January 11, which is the final day of comment delivery. We require a U-Haul to do so. And I understand that such a truck has already been rented. I am asking you now to help ensure that each one of these comments is logged by the DEC, read, and considered. Finally: outside of Governor Cuomo’s State of the State address yesterday, more than 1,500 people protested against fracking. That event included a recitation of the Pledge to Resist Fracking in New York. The Pledge is a solemn commitment to engage in actions of non-violent protest and demonstration up to and including civil disobedience should the Governor greenlight fracking for New York under the undemocratic, fatally flawed decision-making process now underway. Prior to yesterday, more than 6,000 people had already signed this solemn pledge. I am one of them. I dearly hope that we do not have to activate this pledge, that the signatures of thousands of New York citizens alone will have the power to move the Governor to the exit door. But the very existence of the Pledge to Resist Fracking in New York is clear sign not only of loss of faith in the DEC but of loss of faith in government itself. Governor Cuomo will make his decision regarding fracking in New York state in February, 2013. New Yorkers hope he will do the right thing and put science, health and environmental safety before the economic profit of the gas industry. Inspired by the many brave frackatvists in New York, I signed the Don't Frack New York pledge to "join with others to engage in non-violent acts of protest, including demonstrations and other non-violent actions, as my conscience leads me," if Governor Cuomo allows fracking to take place in the state. As a mother, cancer survivor, and environmentalist, I pledge do my best to protect the land, water, air and food systems for the health and safety of present and future generations. Here is Pete Seeger singing "This Land is Your Land, This Land is My Land," at Governor Cuomo's State of the State Address in Albany, New York, on January 9, 2013. (Well, to be more accurate, not "at the address"--Pete was singing with the anti-fracking protesters right outside of where the Governor gave his speech). Pete Seeger has spent his life working to save our water and earth. He's 92 today, and still spreading his peaceful and environmental message. Governor Cuomo, by contrast, forgot to talk about Fracking. 2,000 of us stood right outside where he gave his State of the State speech, with signs, songs, drums, and chants ablazing... We did not forget that our environment comes first. Without clean water, soil, and air, even a good progressive agenda won't matter in the end. We cannot drink gas, or eat radioactive food, or survive global warming. More to come in my next article on the full extent of this event and Fracking. Stay tuned. In the meantime, Good night Irene. It was a long day and it's time for bed. Dear Governor Cuomo: Won't you be an environmental Santa, too? This morning I read Bill McKibben's article about the environmental Santa Claus, the Mayor of Seattle Mike McGinn, who has vowed to divest the city from fossil fuel investment. What a lovely gift right before Christmas and New Year's! I then received a holiday email letter from my very own Governor Cuomo. Nothing personal, mind you, just the mass mailing to all New Yorkers. Still, how very nice to hear from him. I took the opportunity to thank Governor Cuomo for thinking of me and all of us. So, call me greedy, but I also responded with my Christmas wish list (okay, I'm Jewish/Buddhist, and Santa doesn't come to my house, but I can dream, can't I?). I'm not asking for gifts under the tree. I'm asking for clean and safe air, water, food and products--free of toxic chemicals and radiation. I'm asking the Governor to fight climate change. I'm asking for a safe future for all children: a livable planet. Thanks so much for your holiday letter. You have an opportunity to do something really meaningful on this holiday. Like the Mayor of Seattle, you can be an environmental Santa Claus, too. Yes, you can help change the course of human and planetary history! Yes, you can save us all! 1) Ban Fracking permanently in New York State. Fracking pollutes, pollutes, pollutes--gas, chemicals, and uranium in our water. No thanks! 2) Shut Down Indian Point Nuclear Power Plant (35 miles from NYC) before we have another Fukushima--this time, in a densely populated area of four million people. Shut it down, please! 3) Divest all NY state funds from fossil fuel investment. The ice caps are melting, the seas are rising, the weather is crazy. Save NYC, NY State, and the world! 4) Ban all assault weapons and hand guns in NY. Gun control, now! 5) Support the Safe Chemicals Act and institute 'Safe Chemicals' legislation in NY. Keep the toxins out of our products, air, water, and soil. Our bodies can't handle the burden of more poison. Amen and thank you from all the children present and future. Feel free to copy my letter, or write your own. If you live in a different state, adjust your letter as necessary to the needs of your location. Write to your own Governors and Mayors. Their job is to protect, us, the citizens of the United States. We have a right to clean and safe air, water, soil, products, and food. Remind them! Remind yourselves! Wouldn't it be nice to have a country full of environmental Santas protecting our safety and health? This past week, in Connecticut, 27 people died violent deaths. Twenty of these folks were small children. It's inconceivable on the one hand, and yet children and innocent people are murdered every day throughout the U.S. Over 10, 000 human beings are killed yearly with handguns. I agree with Michael Moore, that the violence is about more than weak gun laws or mental health issues--although clearly both are problematic and I'm all for instating rigid gun regulations, and improving our mental health system. Like Moore, I think the problem has to do with our culture. We live in a land of glorified violence and meanness. Turn on the TV, go to a Hollywood film, play a few internet games, listen closely to our language, and watch how our children do or don't play. And, let's not forget our investment in wars and violence worldwide; we, the great American protectors, do a lot of killing on this planet. Notice how much we spend on our weapons--including thousands of nuclear missiles set on hair trigger alert, even though the cold war is over. We spend far more on the military than on education, the environment, and feeding and caring for the hungry and poor--all put together. Our culture of violence lives deeply in each and every one of us, and that is why our streets --even in "good" surburban neighborhoods--are empty of children playing. We are all afraid. Because of this fear, children have had the play taken out of them and this contributes to the cycle of violence. We keep them inside, and/or busy with structured activities, because we're afraid for them, and yet, ironically, our children watch hours and hours of violent images on their computers, smart phones, and TVs. We all know the statistics of how many deaths, rapes, and murders kids see each week on their screens. Of course, there are the children of less privilege. Shootings are nothing new to the kids from poorer neighborhoods. They can't go outside without getting shot, every day, every hour. No wonder our kids bully each other mercilessly. And, no wonder the violence keeps escalating. It's what popular culture represents as normal and acceptable. Fear and violence are fun(ny) and entertaining. Harry Potter, everyone's favorite kid movie, is jam-packed with violence and edge- of-your-seat fear. What about that other recent favorite --The Hunger Games--where children brutally and elaborately murder each other and only one--the most cleverly violent of all, survives? I'm not just blaming Hollywood or the media, though. I'm blaming all of us. Maybe now, since Newtown and the murder of such young innocents, we'll wake up and work for effective change--legally and ideologically. Obama and Congress, as well as all American citizens, must not ignore this issue anymore. There's too much visible blood on everyone's hands. Senator Richard Blumenthal says this is a "transformative moment." President Obama says, "this violence must end" and, today, he pledges action. As Van Jones points out regarding the climate crisis, change has to come from the top (politics and the legal system), the bottom (grassroots activism) and the inside (what I like to think of as the internal heart of our culture). The same goes for our crisis of violence. We need our politicians to protect us from the weapons with gun laws and the elimination of imperialistic war-mongering. We need activists to push for this change to happen. And, the citizens of this nation need a change of attitude: from violence, hostility and anger, to tolerance, peace and love. This might sound radical. It is. In the 1960s, a movement rose up, a movement of peace that drew on the work of Gandhi. Peaceniks marched to end the Viet Nam war and advocated on behalf of widespread non-violence. At the end of the war, they fought to eliminate nuclear weapons. Peaceniks united with the Civil Rights movement to end racial violence as well. They practiced non-violent methods of protest--if the police attacked them, they went limp. Remember the famous photograph of the protester putting a flower in the nozzle of a weapon? Their motto was: "Teach Peace." Isn't it about time we listened to their wisdom? It's time to talk peace education in our schools, religious institutions and in our homes. It's time to rebuild our towns, cities, and nation, and re-envision what a truly "peaceful and sustainable community" might look like. A terrific new student-lead peace project is the Teach Peace Initiative. Get your kids, families, and schools involved in this one! As David Roberts eloquently says in his piece at Grist about the Newtown massacre, we need to develop personal and cultural "empathy." We must recognize that the children who were murdered in Newtown are "all of our children." So, as we bury and mourn the loss of these sweet innocents in Newtown, we must make our goal the widespread cultural development of compassion, empathy, and love-- and, finally, peace. Next door: there are six men with leaf blowers. They have been blowing for two hours. There were no leaves when they started. There are no leaves when they are done. They blew the all the leaves away several weeks ago after Sandy. Yet every week the men come and blow anyway. I suppose they need the dollars to feed their families back home, but they're polluting the air and it is so loud. I want to cry for the earth, but I have no [more] tears. I want to scream, but I don't. The grass they walk on is new. A month ago the men pulled up the old grass and rolled out at a bright green carpet in its place and poured toxic liquid on top so it would be yet brighter. Now I won't grow vegetables next summer, as the chemicals from next door will seep into my garden. What is to be done in America?